We specialize in designing and retrofitting process furnaces for optimal efficiency, and our Air Preheat Systems are an important part of that process. We have designed and installed Air Preheat Systems in a wide variety of both new and in-service heaters to utilize hot flue gas from the combustion process to preheat the incoming combustion air. As a vital part of our nation's production and economy, heaters and furnaces are major consumers of energy. With energy consumption and crude oil prices on the rise, industry leaders are increasingly looking for ways to improve thermal efficiency and conserve fuel and energy. One of the most potent ways to improve efficiency and productivity is to preheat the combustion air going to the burners. Because the air enters the furnace at a higher temperature, less energy must be supplied by the fuel. 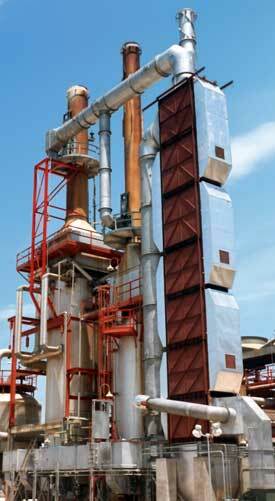 We are a leading supplier of second-generation air preheat systems in North America. OPF has installed Air Preheat Systems in both new and in-service equipment. OPF can analyze your existing furnaces and recommend which type of Air Preheat System meets your needs. We have installed Air Preheat Systems on over 100 heaters since 1973 in size ranges from 12 MM BTU/HR to 360 MM BTU/HR. Years of experience combined with the latest computer technology allows us to design and optimize process requirements correctly, quickly and at a competitive price. If you're interested in our Air Preheat Systems, or if you have any questions or concerns, please don't hesitate to contact us.